Kennie takes a lot of time to develop the plot and the mystery of the story, ramping it all up at the end. The best parts of this story are in the details. The minutiae really brings everything home and makes the suspense even more fast pace. The setting was well put together, allowing me to picture where the characters were and what was happening there. The main characters in this novel were quite interesting and really fit the novel well. I enjoyed them as individuals and as a budding couple. The differences between their undercover personas and who they truly are was interesting. Their emotions shine through, even if they are hidden beneath the surface. It really added to the suspense for me. This was an intriguing romantic suspense. It was my first novel by this author but I will definitely be looking further into her work. Please note that I received a complimentary copy of this work in exchange for an honest review. 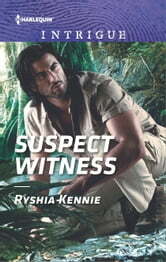 Suspect Witness has the right amount of thrill and suspense and I read it in two sittings. I don't want the book to end, to be honest. Josh Sedovich is assigned to bring home to prime witness to the murder of European billionaire and it was connected to the witness's ex-boyfriend. He thought it would be a case, an assignment, but what he didn't count was growing admiration for her. Erin Argon thought that she was safe in George Town and she can settle down there for a few months until the person chasing her caught up to her. Her survival instinct forced her to run once again to cover her tracks. Erin is just a common woman and her world turned upside down when she was involved in a murder she accidentally witnessed. She flew away from a place to another. The unusual setting drew me to this book. I lived in a country close to Malaysia, so I'm curious what the author would bring. It didn't disappoint because I found myself enjoying the chase around the country. Kennie chose the exotic forest as her destination in the country and soon I was hooked. The beginning of the book had me intrigued even though I have a little bit of hard time getting to know Josh and Erin, but soon I understood and it continued from there. I recommend this book for people who would love the suspense and thrill. Rating: 3.5 stars I received a complimentary copy of this book in exchange of an honest review. Erin has been travelling around the world (running actually) for months in an attempt to not be found by the Anarchists. She witnessed the leader murder a man and the group wants to kill her before she can testify at the trial. Josh, a CIA operative, is sent to find her and bring her back to the United States. When he does find her he goes undercover as a geeky tourist in order to gain her trust so he can stay near her to protect her and hopefully bring her back home. This is a well researched story that takes place in countries around the globe. The descriptions are so vivid that I felt like I was there. However, near the beginning of this story they toured bat caves. While the description was very detailed I thought it was too long so it made it slow getting into the story. I didn't find that part very interesting. The story picked up after that and was very exciting with people attempting to kill Erin everywhere she went. Erin was a good person who gave up a lot when she left home to hide from the Anarchists. She's had to be very careful; watching everything and everyone to be sure they are not after her. She knew she couldn't trust anyone. When she meets Josh, she didn't encourage him or act friendly toward him. Though she does find him attractive and thinks he's just a tourist so there's no harm in spending time with him. I liked this couple and the romance that built as they spent more time together. The suspense in this story had me on the edge of my seat wondering who was going to try to kill Erin next and if they would be successful. I'm glad to have received a complimentary copy of this book in exchange for an honest review. This was a great romantic suspense that I didn't want to put down. I will definitely be reading more by this author.